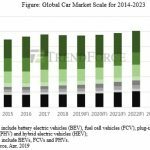 Global volume demand for lithium batteries that power xEVs (plug-in vehicles) is estimated to reach 1.7 billion units in 2016 and grow by 17% annually to 2 billion units in 2017, according to EnergyTrend, a division of TrendForce. EnergyTrend reports that the China has taken measures to curb excessive subsidy payments to domestic xEV manufacturers during the second half of 2016. Thus, the delay in subsidy payments and investigation on potential cases of subsidy fraud have impacted market demand for xEV batteries in the short term. With the investigation winding down, China’s xEV market is expected to make full recovery and again become the key demand driver for xEV batteries in 2017. 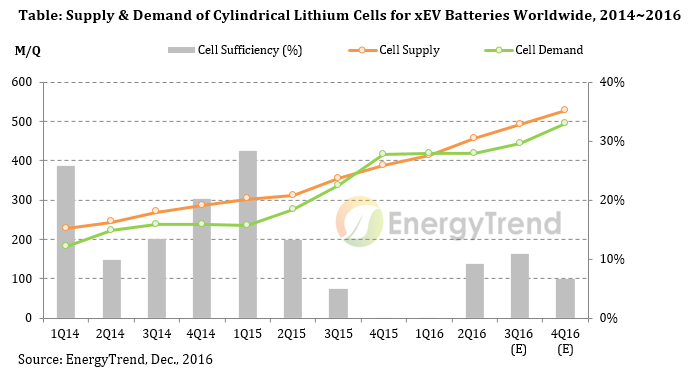 Prices of cylindrical cells used in both xEV and notebook batteries rose in the first half of 2016 due to demand outpacing supply. However, demand growth in China’s xEV market has been constrained in the year’s second half as the government delayed the release of subsidy payments to domestic xEV manufacturers. The situation in China has also affected the global xEV battery market as a whole. EnergyTrend expects this situation is temporary and the Chinese government will announce a new round of subsidy support for xEV companies in 2017. Therefore, China’s xEV market will pick up next year after experiencing the slowdown in this year’s second half. 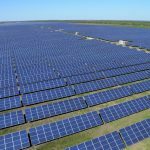 Likewise, demand for xEV batteries will again register healthy growth in 2017. EnergyTrend estimates that the volume demand for notebook batteries worldwide for 2016 will total around 440 million units. Cylindrical cells are projected to account for 44% of this year’s global notebook battery demand. Their share will gradually shrink to 35% in 2017.